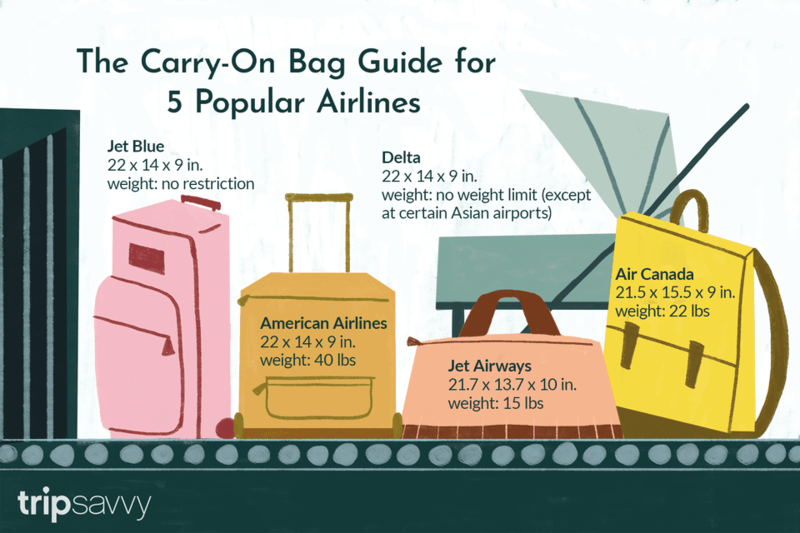 Carry-on bags are subject to size and weight limits by airlines. Since what we bring in a carry-on is important and we don't want to be separated from those items, it's essential to adhere to your airline's requirements for the size and weight of bags you attempt to board with. Most carry-ons sold today measure 22" x 14" x 9" inches. As a general rule, U.S. airlines permit luggage that measures a total of 45 linear inches (115 centimeters), which is the combined length, width, and depth of the bag. This measurement includes handles and wheels. Flights on small planes and international airlines may be stricter with economy-class carry-ons; some will only accommodate smaller and lighter bags. Passengers who attempt to board with larger bags may be required to check them. To be sure you and your carry-on are not separated at the last minute, check with your airline before you start packing as regulations may have changed. Note: On most airlines, a small personal item, such as a purse or briefcase, can be brought onboard in addition to a carry-on. Weight: 22 pounds in Economy. Weight: 26 pounds (includes carry-on and additional in-cabin item). Note: United offers a Basic Economy fare, which only permits "one small personal item that fits under the seat in front of you, such as a shoulder bag, purse, laptop bag or other item that is 9 inches x 10 inches x 17 inches." The airline will charge $25 to bring a full-size carry-on aboard, which you can pay for at check-in. Bags brought to the gate incur an additional $25 gate handling charge (total starting at $50). Airline regulations and baggage policies are subject without notice. Be sure to check with the carrier before you fly. Sizes quoted are for economy-class passengers. Airlines may permit business and first-class passengers to bring more or larger hand luggage. As different airplane models may permit larger or smaller carry-on bags, determine what equipment will be used by your airline. On most airlines, a briefcase, handbag, or laptop computer bag is permitted in addition to one piece of carry-on luggage.